Where the wonderfully average become spectacularly bad. We are Third Year Television Production Students here at Middlesex University and for our major project we are in the process of creating a short single camera sitcom called ‘Amateur Hour’ . With your help, we can bring this creation to life and make a dream become reality. What is AMATEUR HOUR about? Bee (Bianca) - A nervous nineteen year old who finds herself accidentally auditioning for the local amateur drama group's pantomime. David - The mid thirties self appointed assistant director of the group. He wants nothing more than for the show to be a hit. Joan - In her mid forties, Joan runs the society and is constantly stressed but extremely friendly. She was a member of the society for years before she took over managing it. Terrie - Terrie has been involved with the group since she was a child and is in the pantomime every year. Her and Bianca become fast friends. With your generous donations, we can raise the money needed to take care of crucial parts of our single camera sitcom. 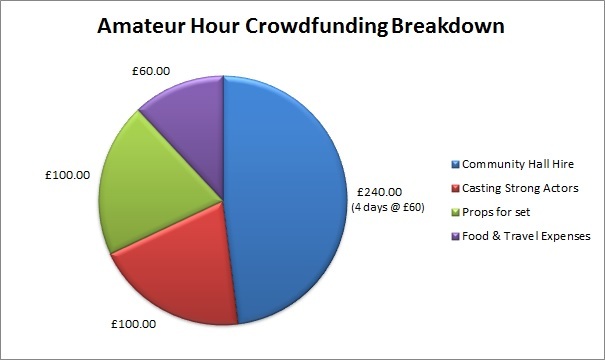 Below you can see the breakdown of how we would spend our minimum budget of £500. We have set our minimum budget to £500 in order to ensure that we can cover the basics in order to bring this to life. Any money we raise beyond our target will go on props, paying actors for their work and will also go towards the private screening that we are holding after the completion of the project. We are appealing to our friends, family, comedy lovers and film lovers to help support us on this exciting opportunity. The rewards are listed on the right and give details for each donation bracket. Each level of donation grants different levels of rewards, therefore think about it carefully before you donate! For certain donors, we will be holding a private screening when the film is completely finished with snacks included! Details of this will be updated closer to the completion of the film. We are currently in our pre-production stages and will begin to hold auditions for the roles in mid January. The production and filming stage will begin in the middle to end of February. Of course if you are also able to make a small personal donation and sponsor our project, we would be extremely grateful! You will receive a personalised thank you message and a shout out on our social media pages! You will receive a shout out on our social media pages and a link to a private online screening! You will receive a shout out on our social media pages, a link to a private online screening and a DVD copy of the show! You will receive a shout out on our social media pages, a link to a private online screening, a DVD copy of the show and unique behind the scenes photos! You will receive a shout out on our social media pages, a link to a private online screening, a DVD copy of the show, unique behind the scenes photos and an invitation to a private screening with snacks provided!